Hendrik Varju has a law degree (LL.B.) from Osgoode Hall Law School in Toronto, Ontario, Canada. In 1996, he left his career as a lawyer specializing in civil litigation to pursue his woodworking hobby full time. He now runs a successful woodworking business in Erin, Ontario and has never looked back. In addition to fine furniture design/build work, Varju has expanded his business services to include furniture repair and refinishing, antique restoration, woodworking instruction, product testing and writing. 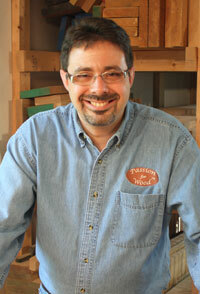 He has shared his woodworking knowledge in a number of woodworking magazines and is a regular contributor to several. He also runs an on-going consultation service, offering both woodworking and small business advice. In this book, “Starting and Running a Woodworking Business”, Varju summarizes some of the most useful information he discovered the hard way, from the nuts and bolts of start-up to on-going issues like marketing and pricing your work. Most importantly, Varju provides templates and examples for the business side of woodworking, such as professional quotations and client contracts. Hendrik Varju provides an example of what can be accomplished through hard work, determination and smart marketing. His own transition from law career to craftsman offers hope to those also wanting to follow their dream. Above all, Varju stands as living proof that one does not have to spend a lifetime suffering with an unfortunate career choice. There is only one lifetime in which to find happiness, and Varju switched into his dream career earlier than most. He now reaps the rewards of a life where work and play are one and the same.